Botany has many technical terms. These are needed because plant structures are different from animal structures —no hearts or livers—yet we still need to accurately refer to the parts of a plant. The deeper you get into botany, the more of these terms you pick up, in order to communicate efficiently. Anther, stamen, stigma, inflorescence, xylem, phloem…very helpful AND they give botanists all kinds of scope to create plant jokes. 1) If you have a flower question, ask a botanist. They know the anthers. 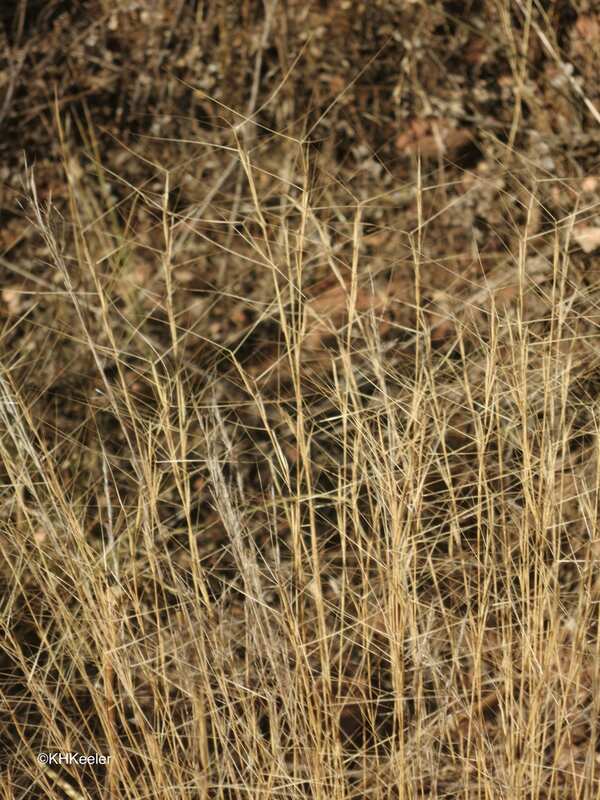 2) In trying to identify grasses, I frequently encounter dilemmas. If I can’t resolve them, I feel glumey. 3) How can we stop telling more lousy grass puns? A: It’s a di-lemma floret it’s worth. Just culm down and don’t `panic’ or I’ll go awn and awn…..
4) Did you hear the one about the botanist who couldn’t identify narrrow-leaved pondweeds (Potamogeton) by their leaf characters? A: He tried in vein but didn’t have the nerve to do it (also there was no stipulation in his contract). 5) Which Potamogeton is known as the musical pondweed? Potamogeton epihydrus—because each leaf features a large lacunal band. 6) Which pondweeds get lonely after the growing season? The ones without winter buds! 7) Why is Potamogeton pulcher better at hide-and-seek in British Columbia than in Connecticut? A: Because in B.C. its stems are not always spotted. 9) Which Potamogeton is prettiest? A: Potamogeton foliosus—it has acute leaf apex. 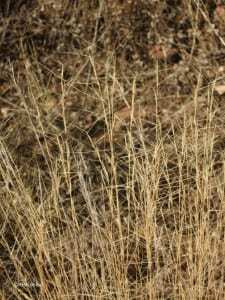 10) What kind of person laughs at sedge (Cyperaceae) jokes? A: One with achene sense of humor! 11) Why are achenes so slow? A: Because they’re never in a rush (Juncus spp.)! 12) Why do some plants have difficulty taking multiple-choice tests? A: they have too many anthers. 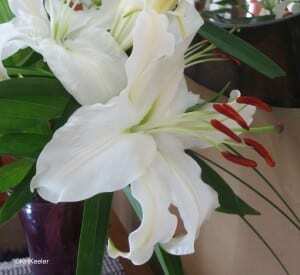 Below: lily with six anthers. (1) Modified from Charles Blair, Plant Science Bulletin 50:4 (Winter 2004). (2) Charles Blair, Plant Science Bulletin 50:4 (Winter 2004). (3) Modified from Don Les, Plant Science Bulletin, 50: 2 (2004). (4-6) Don Les. Menziesia 11(4): 15 (2007). (7) Modified from Don Les. Menziesia 11(4): 15 (2007). (8) Don Les. Plant Science Bulletin, 50: 2 (2004). (9) Don Les. Menziesia 11(4): 15 (2007). (10-11) Don Les. Menziesia 10 (4): 16 (2006) . (12) KKeeler. Thanks to Don Les for pointing me to his jokes in Menziesia.